Thanks to Ken, I received a length of the extrusion that was shown and discussed in the thread introducing the new line scanning sensor. Along with the extrusion, I ordered the sensor, Prop Proto Boards and the Hydra EtherX Ethernet card (no hydra, going to use it with a "bare" prop). The EtherX card is JUST barely too "thin" on the width dimension to be held in the extrusion. To really maximize the utility of the extrusion, especially if offered in lengths other than specifically for the Motherboard, it would be nice if other sensors and cards like the EtherX could be adjusted to fit the extrusion. Another example of a products that could possibly benefit from some "adaptation" would be the Ping[noparse]:)[/noparse]) sensor and even the Prop Stick. As always, this opinion, and $1.00 will get you a bottle of pop from the machine in our break room. There's certainly something right about your suggestion. Just like a 3-pin header and 3"x4" board standards that we use, such a change could improve compatibility elsewhere across the whole product line. Kinda makes me think of the 8020 aluminum extrusion company - you could build anything with their compatible hardware parts. Modifying certain board sizes poses some challenges elsewhere (i.e., Ping))) has several mounting brackets around the PCB size; PIR uses very small PCB real estate and would need to be enlarged). Perhaps there are products which can be easily morphed to fit the extrusion, and those which can't. Phil Pilgrim is making quite a bit of progress on the different daughterboards for the MoBoStamppe, and they all fit within the extrusion. For now, we're taking the next steps to have the extrusion in stock to accommodate the MoBoStamppe + daughterboard lineup. We'll talk more about your idea when you are at Parallax on June 27/28th. Carry on with the discussion - I'll be watching. You could always cut a piece of board that fits and hot glue the other part to it. May not be the most efficient use of space but it would let you mount the part. Unfortunately, I won't be making the California version of the Prop expo, but am planning on making the Ohio version. Like you I'm very excited about the possibility of this tube as a "standard shell", and I'm already designing stuff for it even though I don't have a sample as yet (my order has probably slipped in between the cracks 'cos there is no official part yet, I'll chase that up shortly). I don't know if you're familiar with Unistrut, but its a similar steel profile used for just about any kind of mechanical mounting, welding etc. The Parallax extrusion is of similar dimension but much prettier and more useful as it unites the electronic and mechanical. Below's a cover design I'm getting laser cut. Your idea of standardizing the modules is a good one. It could be done just by adding some small tabs during the PCB routing, these can easily be filed off to make it backways compatible. Just a note on using the extrusion with the TCS230-DB color sensor. It appears that the color sensor will not slide into the extrusion when attached to a BOE Mother board (I don't actually have a mother board). 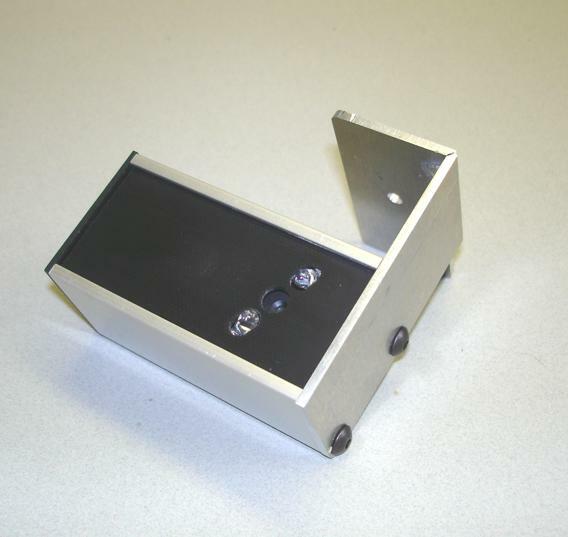 The plastic standoffs for the light source LEDs interferes. By rotating the sensor 90 degrees, it will slide in. This is fine for my purposes, but may be a problem when used with the Motherboard. On my assembly, one side (the right side when looking at the image sensor side with the "TAOS" logo on top) will clear, but the other side will not. The TCS230 board is Version 1.3. You are correct. All you have to do, though, is clip the little plastic corners off the LED holders. They serve no useful purpose. Then you can slide the board in, plugged into the MoBo. The spacing of the LED mounts was one of those compromises I have to make sometimes. I would like to have mounted them closer together, but then the subject distance became an issue, and they would've been perilously close to the lens holder. So I settled on making sure the stanchion portion fit the extrusions with an eye on trimming the angular parts when necessary. 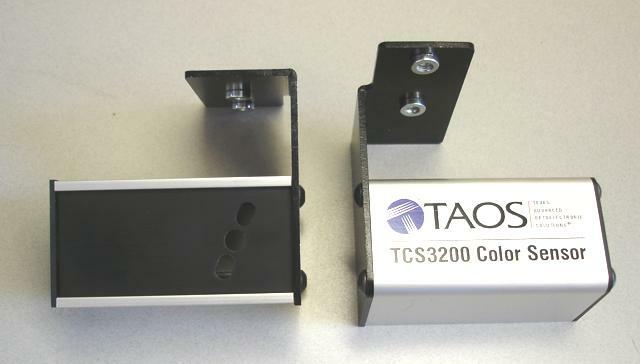 Attached are some photos of a special enclosure I did for TAOS for a trade show demo that uses the extrusion. The TCS230-DB (repopulated with a TCS3200) is plugged into the MoBo. The whole assembly was tethered only by the USB cable. Thanks for the confirmation and the info on trimming the standoff. To other users: There is room to trim the standoff without getting to the LED leads, but you need to be careful. If you do trim all the way to the LED leads, this still shouldn't be a problem, as they are far enough from the edge of hte board and shouldn't be a problem. Did I read somewhere that someone had a prop based board that fits the extrusion? Can someone direct me to the source? There is room to trim the standoff without getting to the LED leads, but you need to be careful. You shouldn't need to trim the standoff portion at all, just the 45° section. The extrusion is bowed in slightly at the top, and it helps to flex it outwards a little when you're inserting boards — particularly the TCS230-DB. id I read somewhere that someone had a prop based board that fits the extrusion? Yes: two of them, in fact. The one on the left in the photo below (Propeller Backpack) is nearing production and accepts one daughterboard. It's powered via a three-pin servo connector, which also provides communication. 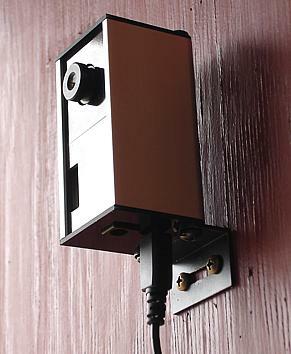 The stereo phone jack is for both audio and video. It can't be used in the bottom extrusion slot, though, due to some protruding header pins too close to the edge. Any other slot is okay. The one on the right (MoBoProp) is still in development. It will accept two daughterboards and is meant to be the Propeller complement to the MoBoStamp-pe. The phone connector is for audio and video but won't have the same capabilities as those of the Backpack, which was designed for enhanced A/V use. Ah, okay, I see where the confusion comes from. What you're calling the "standoff" is actually two pieces: the stanchion (or what I called the "standoff"), which doesn't need trimming, and the little 45° piece sitting on top of the stanchion with the jutting-out corner that does. My apologies for the confusion. I guess if you didn't know ahead of time, there's no way to tell by looking that the plastic LED "standoff" is two pieces. We're still not quite on the same page, but we're getting closer, and I'm the one on the wrong page (duh - big surprise there). I was putting the card in the outermost slot, so I didn't even notice the 45 degree piece interfering. Indeed, it was one of the plastic standoffs I was seeing the interference on, but as you said, if you put a little outward pressure on the extrusion, all is well there. Looking now, I can see where the 45 degree pieces would need to be trimmed. Probably something to put in the docs for use with the extrusion. (Yikes, what a long way around.) I probably should have posted pictures, but the camera wasn't handy. Maybe latter tonight. Thanks for sticking with me, and getting me on the right path. Attached is a preliminary description of a proposed set of panels for the extrusions. I'm posting it here in case forum members want to offer suggestions. It's important to keep the number of SKUs to a minimum, while still handling the majority of desired combinations. The standard MoBo system protocol simplifies this somewhat, in that interface daughterboards are usually plugged into socket "A", with sensor daughterboards being plugged into socket "B". This obviates the need for an entire separate set of end "B" panels with connector cutouts. Anyway, take a look, and see what you think. Looks good to me Phil. It may be worth having a blank end plate too. I can imagine sometimes wanting to bring an electrical conduit out. Also some thought needs to be given to how to mount the whole assembly. Off the top of my head, I can't think of something that preserves the existing elegance. 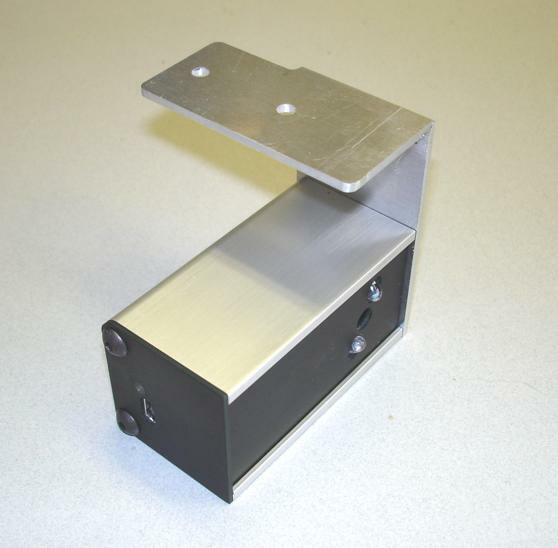 However Hammond have angle end plates as per attached photo... the 78mm wide x 43 high one could be cut in half to give 2 x 38mm wide flanges perhaps. Depends where the holes end up after cutting. I thought about the blank endplate, but since the extrusion will be sized for a MoBo, and since the DBs won't typically be used without one, the MoBo cutouts will always be necessary. That doesn't mean I can't be persuaded otherwise, though. You're right Phil, the connectors would stick through. Using a basic end plate with just the lower cutouts would still leave enough room for a gland or cutout higher towards the cover plate. Upon further reflection about this the OD of the extrusion is very common, how would something like this go at the midpoint? What is that thing, exactly? This is the kind of thing I store in the biological equivalent of bubble memory part of the brain. ····sing it when it does. Here it comes." 'Problem is, half the time it manages to come 'round on the guitar, I'm asleep! Tubular, What is that thing, exactly? _that_ would be yer trusty cross clamp. Typical application would be in say a beverage factory, with a 40mm bar going across and above a conveyor, and the smaller port dropping down to lane dividers. Keeps everything square. 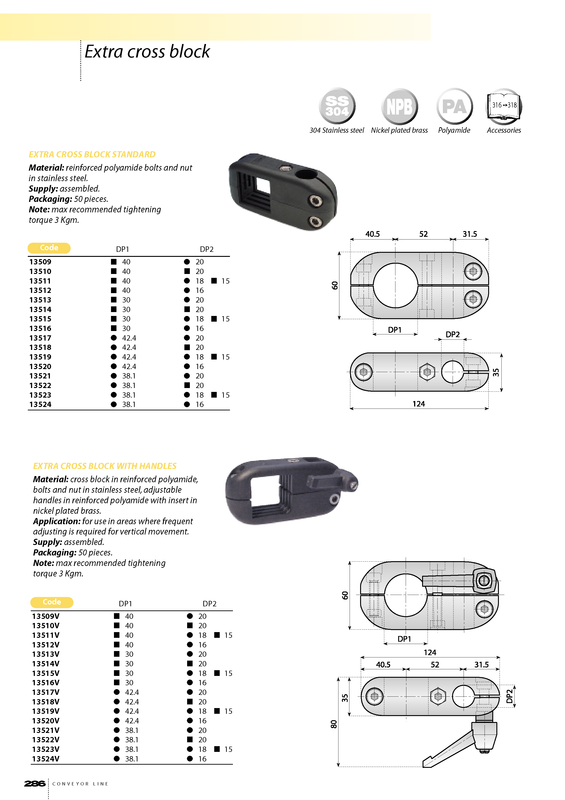 They're available with 0, 1 or 2 quick release handles from companies like Marbett (Germany), System Plast (Italy). There is sure to be a 1 1/2" US equivalent, though the extra few mm of the 40mm may actually accommodate the 2 less radiussed cover plate corners better?? Ah, a cross clamp. I get it now (and would've killed for such a device in my industrial installation days — especially at a certain gin-bottling plant). I need to make one more mod to the end bracket: a bulge in the middle of the mounting slot for a 1/4" (6mm) screw. This will enable the bracket to be used with strut systems. I've got RFQs out for the laminate parts and am shipping the whole kit of hardware samples to Parallax today for their evaluation. I don't think my laminate engraving supplier does aluminum, though, so I've got to find someone else for that. Blank endplates are always a good thing.· Yes, the MoBo will be the primary use, but there are others (self included) that don't do the STAMP thing.· I fully understand the desire to limit the number of SKUs, and I would think a blank plate would be part of the answer.· Have a plate for the "common" holes, and if that doesn't work, use a blank. Any ETA on when this AL extrusion will be available? Will 2.75" lengths only be available, or will other lengths too? wondering whether any of this magic extrusion is still available. Phil? Anyone? I actually needed more of these myself for a customer project, but no luck. Ken scoured the warehouse for me but couldn't find any. Dunno what happened to them, but I still want some! The (almost) last of my original stock is at a local machinist -- as of today in fact -- being cut and milled into 2.750" lengths. But those are all committed to a customer. The original extrusions were sliced from stock shapes offered by a heatsink company. But those shapes have been discontinued and are no longer available. The Parallax version was an improvement over the originals, by providing additional clearance for a board mounted in the bottom slot and -- IIRC -- one additional slot. Tubular, how many do you need, and what length? If it's only one or two, I can definitely accommodate. I'm thinking of using it for a new P2 product, its not out of the question to get something custom but always best to start with something existing where possible. Lansing also sell something vaguely similar but significantly wider. But to be honest its quite a useful form factor. You probably already know this. 'Glad you found some! I just got my cut-down extrusions yesterday from the local machinist. This guy's amazing! The extrusions are within a mil or two of the correct length, and the price was right. Truth be known, I didn't trust him with all that I had -- only about half. If he screwed all of them up somehow, I'd be tap dancing, looking desperately for a quickie extruder. But he's earned my confidence, in spades! The extrusions are done in -- and shipped from -- China, however. With the new aluminum tariffs being what they are, I'm not sure that this is a viable solution. OMG, Parallax, where did your extrusion stock disappear to? I need it -- desperately! For what you need, surely the material costs are small, compared with the NRE/tooling costs ? What is their MOQ and setup/tooling charges ? Stumbled across this yesterday for something and when I saw this thread today, I figured I would pass it on. Haven't been able to verify that you can buy sticks of the extrusion, but with the way it is designed, you can make any size 1U height enclosure you want. Top, Bottom, and end panels can be easily cut on a laser or cut out of sheet plastic/metal.